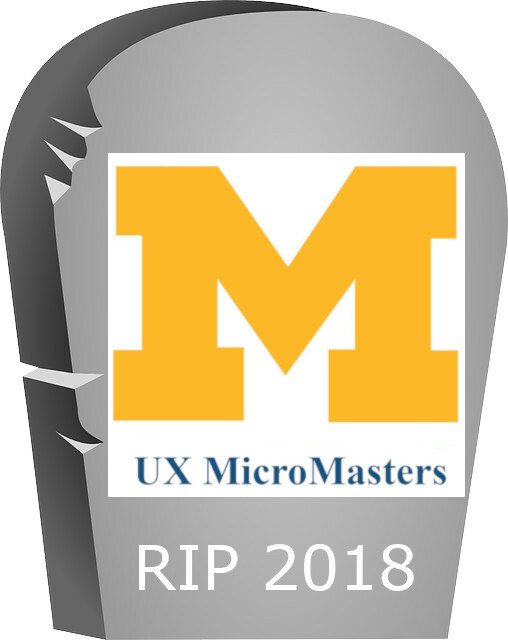 The UX MicroMasters lasted less than 2 years. Not only have students not got the option of enrolling in the program anymore, UM cut off new registrations for some of the courses on November 6, 2018. Students who have registered have until November 30, 2018 to verify if they want a certificate and possibly earn the MicroMasters. The capstone must be completed before June 30, 2019 it seems. The deadlines and other details can be found on their UX Micromasters Program Updates page. Interestingly UM tells students that are still interested in UX courses to check out their UX specialization on Edx rival Coursera. But they firmly remind perspective students that the specialization on Coursera does not give students any chance usingas credit toward the on campus MSI. Early this year Edx had experimented with charging $9 for access to some courses, a few of the UM UX courses were part of that experiment. It seems the remaining courses students can register for now do not have any fee to audit. These courses could disappear at any moment so if you are interested go register for them immediately. UM has two other MicroMasters on Edx in Education and Social Work. Hopefully they are not going anywhere.